Hotel Green is a three star property located at a walking distance from Ganga river, Ram Jhula and Parmarth Niketan in Rishikesh. The world famous sacred Ganga Arti is performed at just a stone throw away distance from this place. This purely spiritual blissful arti at the bank of the river makes the hotel more desirable. It offers a splendid experience with its lush surrounding, serene atmosphere, landscape view and rich variety of food. The hotel can be reached either by ferrying across the river or by crossing the famous Ram Jhula. The hotel also provides the rooftop enchanting view of mountains. The hotel is conviniently located opposite to the NH 58 Badrinath-Kedarnath way along the coastal line of river Ganga in Swarg Ashram. It also shares its location with the famous Beatles Ashram which is at a 5 min walking distance. A very beautiful place with peaceful and natural environment. The hotel and a scenic view of river Ganga which gives a breathtaking view during the sun set. There are large no. of rooms ranging from standard to deluxe, super deluxe etc. The rooms are beautifuly crafted, well decorated with elegant furniture and the interior. 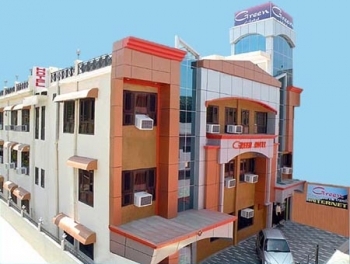 To make the stay more comfortable the rooms are equipped with all modern amenities like AC rooms and Non AC Room, attached bathrooms with 24 hours hot & cold running water, heater (on demand) and other basic amenities. Room service is availalble 24 hours. Private balcony and windows offers a fascinating view of Raja Ji Nantional Park and Neelkanth Hills. The hotel features a good restaurant which offers a rich variety of dishes.They have a choice of really good penne/spaghetti dishes, and also serve European style coffee. The in-house multi cuisine restaurant is designed with the touch of Indian tradition. 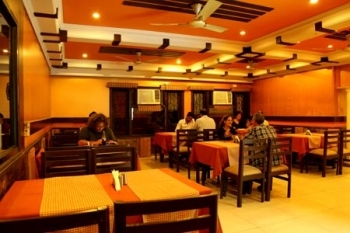 It is centrally is air conditioned and offers a warm ambience with homely feel. The staff is well trained and deliver their best in any type of cuisine. The hotel offers number of activities such as Yoga Classes, Panchakarma, River Rafting, Trekking, Oil Massage, Shirodhara, Pain Management, Stress Management, Beauty Treatments, Hair Treatments and Weight Reduction. By Air : The nearest airport is Jolly Grant Domestic Airport aprox 18 Kms from Green Hotel. Jolly Grant operates regular flights to Delhi and other major cities of the country. By Rail : The nearest railhead is Rishikesh but it doesnot have train connection to all the major cities. The main inter state junction is Haridwar junction at a distance of 25 kms from Green Hotel. By Road : Rishikesh is well connected to NH- 58 through which tourist and travelers can easily reach Rishikesh from any part of India.